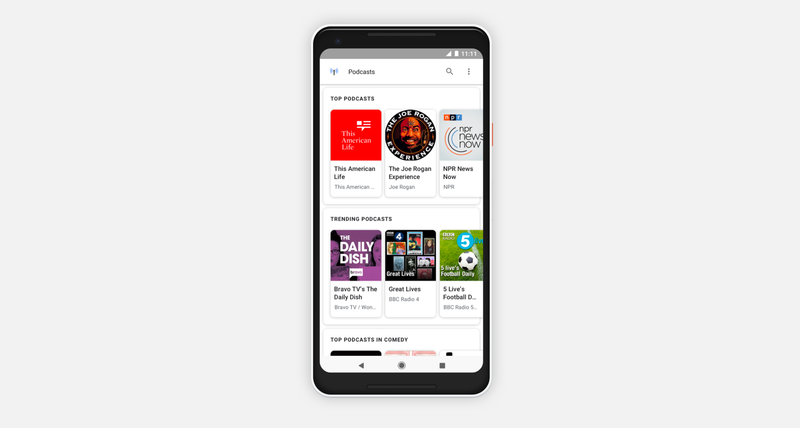 “Our team’s mission is to help double the amount of podcast listening in the world over the next couple of years,” says Google Podcasts product manager Zack Reneau-Wedeen. 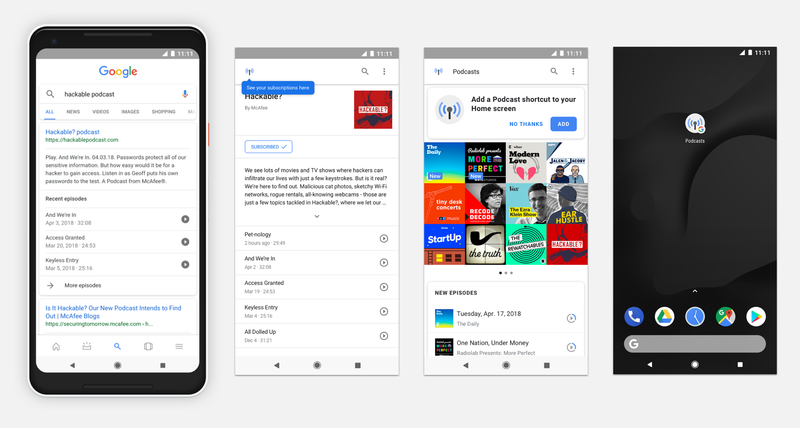 Google hopes to do that by improving the podcast experience on some of its biggest platforms — Android, Search, and Assistant. Shows and episodes are now integrated into Google Search and Google Assistant, and they have become “first-class citizens,” appearing towards the top of the results you’re already used to seeing. This will help users discover podcasts for the first time, and it could lead to a broader diversity of shows being stumbled upon and enjoyed. Podcasters will also have the opportunity to reach the people that they know will enjoy their show using search algorithms. In the future, podcast metadata will allow individual episodes to appear in search results, helping users find shows based on specific topics or people. Google also plans to later transcribe as many podcasts as possible into text. This would allow users to search not only for individual episodes of a podcast, but also for specific sections of a podcast to quickly find certain content or information. It will also allow us to scrub ahead during a podcast and see written previews of what’s to come so that we can easily locate what we’re looking for. Perhaps even more importantly, text transcription could also allow for language translation, so we’ll be able to enjoy foreign podcasts in our native tongue for the first time. You’ll be able to view all show episodes and subscribe from within Search and Assistant results, and an “Add to home screen” option, already available, lets you place a shortcut for easy, one-tap access to your favorite shows in the future. You can also ask Assistant to play podcasts for you on your Android and Google Home devices. The Podcasts “homebase” is where you’ll find all your subscriptions and episodes, as well as sections for things like Top Podcasts, Trending Podcasts, and charts for a variety of categories. The recommendations you will see will have been chosen based on your existing subscriptions, and they’ll get better over time. Google might also make suggestions based on interests it has gleaned from elsewhere. For instance, if you’ve recently rented a movie from the Play Store, you might start seeing podcasts based on that movie in your recommendations. “Podcasters are creating so much useful content,” Reneau-Weeden says. “We can help make it more accessible by helping people find it when they need it or when they want it, and working to integrate it seamlessly as you live your life.” Billions of people are already browsing and searching, and Google believes that if it places podcasts right in front of them, it could attract “millions and millions” of new listeners. Google will sync your subscriptions and progress across all of your devices, so you can transition seamlessly between them. Later on, this functionality will expand to “every surface where you use Google,” including your desktop. This will allow you to begin listening to a podcast at your desk while at work, then pick up from right where you left off on your smartphone on the way home. 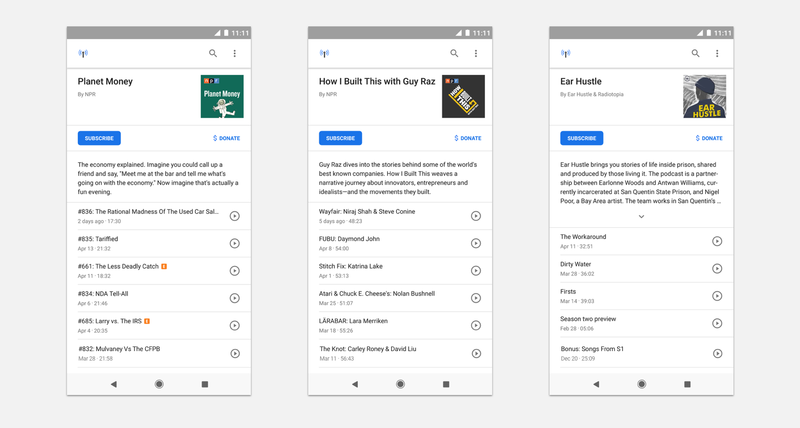 “We want to create an environment on Android where it’s just as easy to get started, and it’s actually the best experience possible for discovering and listening to podcasts,” Reneau-Weeden says. Google hopes these changes will lead to a significant rise in listeners on Android, which in turn will result in an investment in more diverse content. It could also boost revenue for podcast creators. Google expects advertising to remain the primary source of income, but the company is working on new ways to supplement that, such as “Donate” buttons that will allow users to support their favorite shows directly. There is no standalone app for Google Podcasts yet, but Pratt mentions that “it’s not difficult to imagine Google packaging it into a dedicated first-party podcast app for Android” later on. In the meantime, Google has already started implementing some of these changes, like podcasts appearing in Search and Assistant results, so you can start enjoying them right away. Others will take a some time to perfect and execute. But they’ll be well worth waiting for, and they signal an incredibly exciting future for podcast listeners who are going to benefit from a vastly improved user experience that we’ve never seen before.